A few weeks ago, I went to my local Cinemark theater for the 40th anniversary of “Jaws.” For many years, “Jaws” has been considered a perfect summer film that expertly delivers a true thriller experience. “Jaws,” based on Peter Benchley’s 1974 novel of the same name, was released in 1975 and directed by Steven Spielberg. The story is centered around a giant great white shark that attacks many beachgoers on Amity Island, a fictional summer destination. As a result of these attacks, local police chief Martin Brody, played by Roy Scheider, goes on a hunt for the shark. Brody is assisted by oceanographer Matt Hooper, played by Richard Dreyfuss, and shark hunter Quint, played by Robert Shaw. Though this film seems very simple, it is quite intricate. To me, every part of this film is perfect. The performances given by Scheider, Dreyfuss and Shaw are amazingly well done. 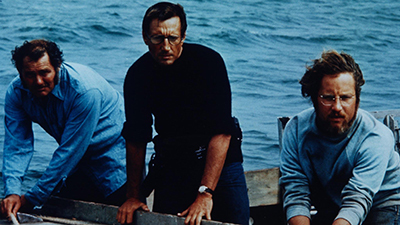 As the film progresses, you become more and more connected to Scheider’s common-man police chief, Dreyfuss’s witty oceanographer and Shaw’s pirate-like shark hunter. Aside from acting, Steven Spielberg did a fantastic job directing the movie. Despite going over budget and past schedule, Spielberg managed to save the film. Several mechanical sharks suffered malfunctions during filming, pushing Spielberg to switch to a minimalistic Hitchcock style of suspense, showing things from the shark’s point of view. Added to this is John Williams’ legendary theme, that is simple, yet terrifying. Williams’ theme is so unique and memorable that it has become synonymous with almost anything shark related. “Jaws” is pretty much the film that created the summer movie season, and it did so for a reason. It has remained a cult classic for years on end because it creates a perfect sense of suspense and fear in its viewers. It is an important part of film history and will always be one of my all-time favorite movies. I couldn’t care less about criticisms of the movie because, in my mind, it did its job perfectly. It is entertaining, engaging and just one hell of a movie.